I love my rice cooker. But I didn’t really know this consciously until the day I found out that outside of my little sphere of existence it is considered a single-use appliance, a uni-tasker, a *gasp* non-necessity. Truth be told, I never even thought that much about it. It was always there, parked in a corner of our kitchen counter (it always had priority of space) in every single house I’ve lived in. When I got married it was one of the first things we chose for our registry. Not with much fanfare, just a sort of preliminary requirement before moving to more exciting things like the Rabbit and choosing the china pattern. It went beyond necessity. It was a given. A never-thought-twice-about non-negotiable. People in favor of the rice cooker have cited that it can be used for other things as well. And I am all in favor of that. But that’s just icing on the cake for me. I need a rice cooker to cook rice…over and over and over again. I am well aware that you can prepare rice on the stove top in any old pot that you can also use for a million and one other things, and quite easily at that. But not easier than throwing it all in the rice cooker, pushing a lever, and forgetting all about it until the “ting” that signals perfectly cooked rice…each and every time. And when you cook rice every single day, sometimes for every single meal, you need the easiest easy you can find. My rice cooker comes with all sorts of attachments and add-ons. I have a steamer basket, a sort of four compartment pan for poaching eggs, and a basket for cooking noodles. These accoutrements are usually on the shelf, untouched, as the cooker focuses on its main task. A wonderful surprise gift though made me rethink that steamer basket. A good friend of mine from all the way back in university sent me a message that his sister had a stock of Chinese goose liver sausages and could spare a couple…would I like some? Would I?? Oh yes please and thank you with a cherry on top! – Rinse and drain the rice a couple of times. Place it in the rice cooker and make sure that rice is evenly spread across the bottom. – Arrange the sausages, mushrooms, and pechay in the steamer basket and place on top of the rice. – Cover and turn the cooker on. – Midway through cooking turn the sausages and move the vegetables around a bit so they take on some of the oil from the sausages. – When done, remove steamer basket. Fluff the rice with a fork and return steamer basket on top. Cover and keep on the “Keep Warm” setting for an additional 10 minutes. – Slice the sausages thinly on the diagonal. Place rice in individual bowls and top with sausage and vegetables. – Serves 2 (although you will have leftover rice). You can also use a regular pot with a steamer basket on top to make this if you really don’t think a rice cooker should be part of your life. My searches through the internet for a recipe to prepare the sausages came up sadly lacking. My friend, and a few others on Twitter, suggested steaming it with rice. Hence my rice cooker’s steamer basket was pulled into active duty. Cooking it this way is perfect as the flavorful oils from the sausages drip onto the rice while it steams. As the flavor of the goose liver sausage is quite strong I added some vegetables to the steamer alongside the sausages – some pechay to counter the sausages’ richness and shitake mushrooms to complement it. This worked so well that I am putting the steamer basket into regular rotation and finally elevating my rice cooker into something more than just the one-trick pony it is accused of being. So to all those “non-negotiable fixtures” in our life that are so essential, yet so often under-appreciated…I salute you! You keep on truckin’ so we can keep on truckin’. May your constancy never make us complacent. I'd love to try those sausages. Interesting! A delicious looking dish. I havenever heard of goose liver sausage. Sounds interesting. My Thermomix cooks rice perfectly. i can NEVER live without my rice-cooker! I am really curious about this Chinese goose liver sausage! Thanks Rosa! They are really delicious! stumbled upon a simple japanese recipe using the device. basically adding sweet miso, soy sauce and mirin to the (preferably japanese) rice grains and water and letting them all cook together. when the switch clicks to the "keep warm" mode, mix in some oysters and let it sit for a few minutes. then serve in bowls with slivered green onions. no fuss cooking with delicious results. Oh, my! 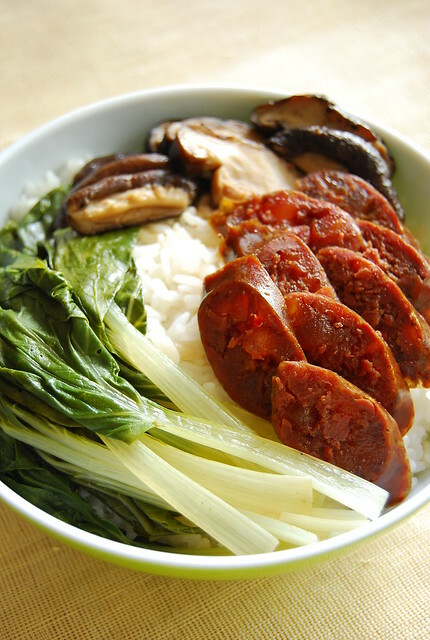 Mushrooms and Chinese sausage (lap cheong or the kind with goose liver) taste so good on rice! Waahh….I miss this liver sausage! Thanks for posting this and made me remember my dearly departed grandfather, who is Cantonese. And this type of sausage, among a few others, is a regular on the dining table. It can be mixed in fried rice, as an appetizer, congee topping, and many more. This is a very savory dish and now I need to ask my mom to get me some soon! This looks delicious! Thanks for posting! chinese goose liver sausage is the best, missing it right now! I love how your food photos are always beautifully styled. That's a PERFECT bowl of sausage right there! Hi Val! Thanks for the tip! So I just put the sausages in the water with the rice? Hi Mom-Friday! Wow, a lot of history there! This was my first time to try it 🙂 I can imagine how good it would be in fried rice! Hi Veron! This was the first time I had ever tasted it…what had I been missing! My friend told me he ate a dish having goose intestines & that totally put me off… I must say, yours look more tempting!! yes! after washing the rice, just put the sausages in before you turn the rice cooker on 🙂 the resulting rice will crust a bit on the bottom but thats delish, too! Goose liver is good, no doubt. And the lap chong (Chinese sausages), heavenly! Great dish. I am refreshed by your usage of weight instead of only volume in your recipe. I'll have to try making this inside a clay pot. How do you pick a good goose liver sausage? Wow, what an awesome idea. I've never thought of using the rice cooker for anything other than plain rice. Now there are endless possibilities!